Hotel Vip Executive Suites Eden, Lisbon. 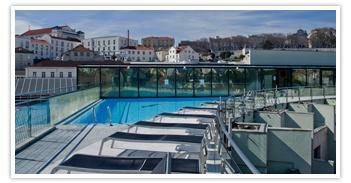 Vip Executive Suites Eden Hotel Lisbon. The Hotel VIP Executive Suites Eden in Lisbon is a four star hotel in the city centre of Lisbon, close to Praça do Rossio. It allows to reach the International Airport in 20 minutes and the main station Santa Apolónia in just 10 minutes. The VIP Executive Suites Eden is prestigious and well equipped hotel awarded by the Portuguese Government in 1996 has 'The best urban renovation project' and 'The best tourism Project in Portugal'.